Hypnotherapy Courses from Within Sight Training. 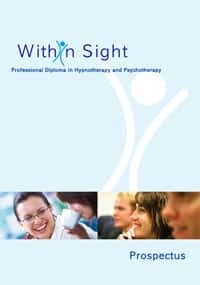 Within Sight Training has a range of Hypnotherapy courses from leading Trainers. Jill Wootton founded Within Sight and created a new professional diploma in hypnosis and psychology. Jill has appeared on various radio and TV programmes. These include: Chris Evans’ drive time show on Radio 2; Sky One’s ‘Angry Britain’; and the Trisha Goddard show.